There are so many things you can do (or use) to help improve your life. We’re very blessed to have meditation apps on our devices these days. It makes something important very easy to do and accessible to almost anyone. I highly suggest adding meditation to your daily routine. 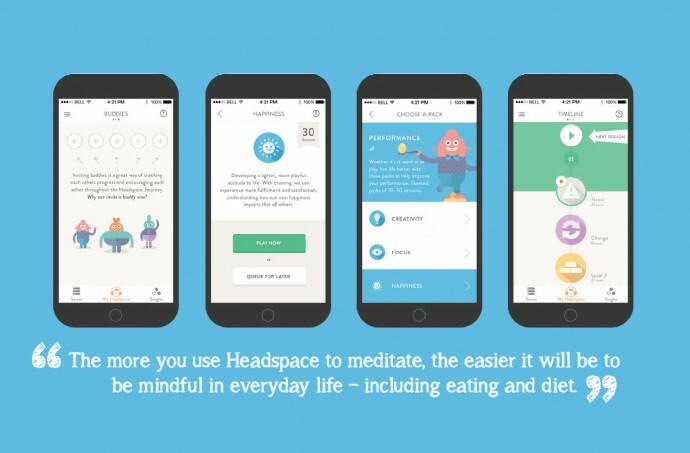 After using many different types of apps, my favourite by far is Head Space. You get a FREE 10 days of meditation, which is ideal for creating a habit of sitting down for just ten minutes each day and working on your mental health. Check it out, share with your friends and family and give it a go. My favourite book at the moment is The China Study . I read this book over 6 years ago and now reading it for the second time. It still bows me away. The China Study examines the relationship between the consumption of animal products (including dairy) and chronic illnesses such as coronary heart disease, diabetes, breast cancer, prostate cancer, and bowel cancer. The authors conclude that people who eat a whole-food, plant-based vegan diet—avoiding all animal products, including beef, pork, poultry, fish, eggs, cheese, and milk, and reducing their intake of processed foods and refined carbohydrates—will escape, reduce, or reverse the development of numerous diseases. The book is based on the China–Cornell–Oxford Project, a 20-year study—described by The New York Times as “the Grand Prix of epidemiology”—conducted by the Chinese Academy of Preventive Medicine. T. Colin Campbell was one of the study’s directors. It looked at mortality rates from cancer and other chronic diseases from 1973–75 in 65 counties in China; the data was correlated with 1983–84 dietary surveys and blood work from 100 people in each county. Each day, as we get ready to head out of the house, we all put on our favourite deodorant and fragrances and cosmetics. Most are unaware of the products we use on our skin are often full of toxic chemicals. After using these products day in day out, it can then cause many skin issues and other health related problems. Black Chicken Axilla is a 100% natural alternative that actually works. I won’t use anything else. Stay tuned for a dedicated post on skin products and deodorants in general. Adding on to the above information, we all like to head out to a special event smelling nice with your favourite perfume. My favourite is a beautiful Natural Oil Blends from ‘Doterra’ named Whisper. The blend of Bergamot Peel, Ylang Ylang Flower, Patchouli Leaf, Vanilla Bean Absolute, Jasmine Flower Absolute, Cinnamon Bark, Labdanum, Vetiver Root, Hawaiian Sandalwood, Cocoa Bean Absolute, Rose Flower. Simply beautiful and will rival any fashion boutique label you’d pay top dollar for. I love utilising any spare time with Podcasts. They’re free, entertaining and a perfect way to broaden your mind. Currently my total favourite is with Tim Ferriss. Tim approaches life very differently than most people. In his Podcast he interviews world class performers from lots of different fields; from health researchers, to chess prodigies to military strategists. You get an insight into the habits and tactics that these people use to get to the top of their profession. Always interesting information I don’t think I’d ever hear about anywhere else. Do yourself a favour and give it a listen.